WETMIXR BAGS is a continuous modular building site mixer for dry premixed mortars or plasters which can be easily handled by one person only. 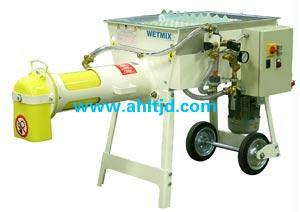 The mixer is equipped with a hopper for manual bag feeding. The heart of the machine, i.e. the mixing chamber and the combined screw/mixing shaft, are manufactured from SINT?engineering polymer. The mixing chamber liner is protected outside by a carbon steel casing. Thanks to the modular design, each section of the mixer is lightweight and easy to handle. The entire disassembled unit can be transported in a normal motor car. The dry premixed material is extracted from bags and transferred by the feeder screw into the mixing zone where water is added to produce the wet mortar or plaster mixture ready for use. Thanks to the SIN engineering polymer daily self-washing of the inside of the mixer can be carried out in less than two minutes.